What is more beautiful than the loveliness of the woods and the first rays of the new rising sun? Hello February! The month of love.. Yes, I am inspired by love. It's how much we love what we are doing. 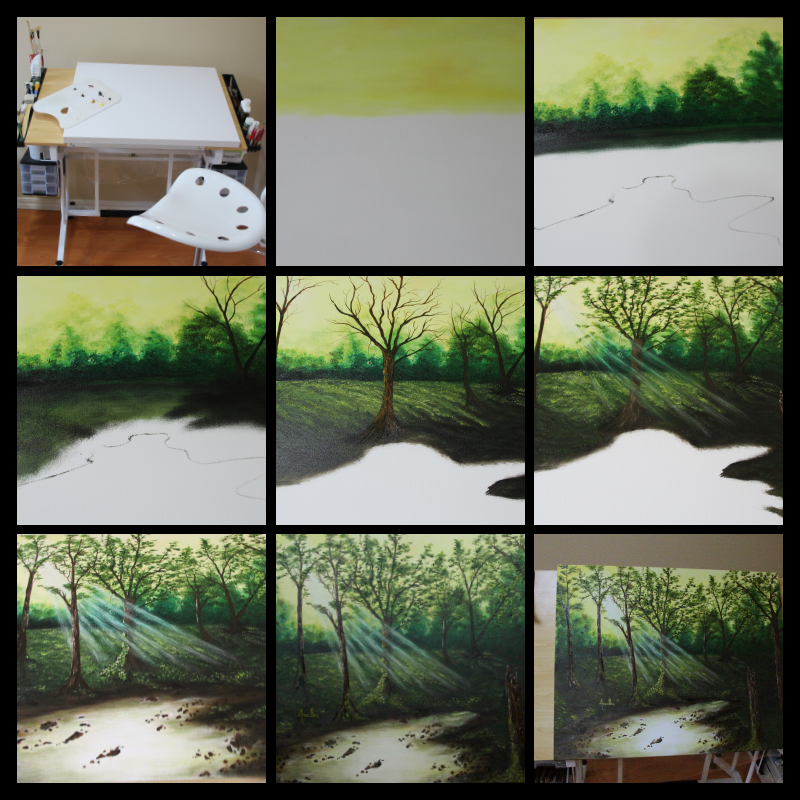 My love for painting and the color green induced me to create this monochromatic landscape artwork (24" x 30"). "The only way to do great work is to love what you do"- Steve Jobs. Soak yourself with some morning rays as it take you to a new place through this oil on canvas(heavy duty)... Lush green rainforest with its natural and refreshing body of water is what this painting is all about. Green is the prime color of the world and from which its beauty arise. Such is this monochromatic painting with the green hue that stands out with the subtle hues of yellow, white and brown. Nice little glow in the sky with bushes and lots of trees that were the towers of the forest sets the back drop for this work of art. The light is filtering through the trees where its mostly covered up. Sketched in the water body and under painted some water that reflects a bit of light from the sky. Gorgeous tree stands out especially the ones that goes over the light area. Beautiful branches and few leaves randomly covering up some of the background add life and depth to this art. The foreground tall trees and an old stump creates interesting contrasts. Simultaneously, beautiful highlights gives the indication of light source and the dark shadows reveals the depth in this painting. Always follow your inner voice to do what you love and love what you do! Sometimes this is all we need. Thanks for stopping by and for your valuable comments as a little encouragement goes a long way :) Have a pleasant sunshiny day! WoW! This is a masterpiece. I like the rays of the sun. Beautiful artwork!